Big Windup! Season 2 contains all 13 episodes of the TV series plus bonus episode 12.5. Hits and sprints, pains and sprains... Mihashi and team have quite a struggle ahead of them if they want to play on the legendary field of Koshien Stadium! Special Features: Clean Opening, Clean Closing, original U.S. Trailer. 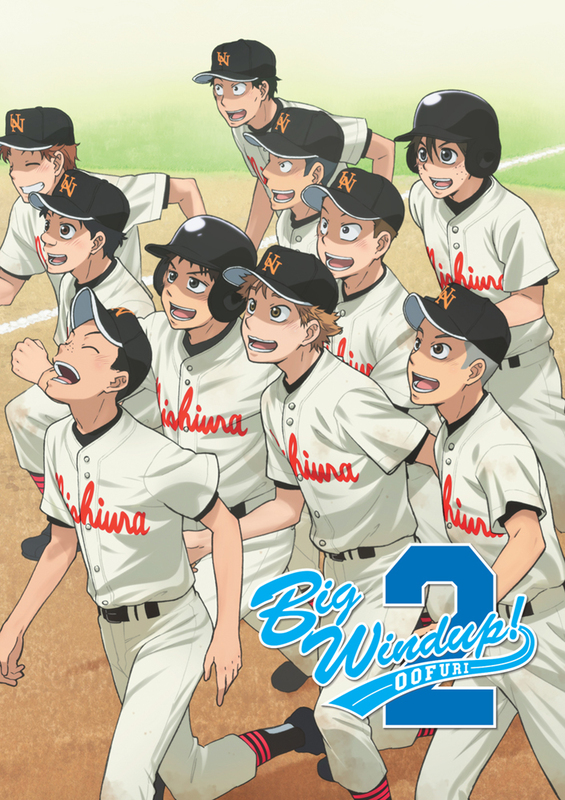 Finally the Second Season for Big Windup! I really love Big Windup! Cannot wait to watch the 2nd season, to see what happens with Mihashi, Abe and the rest of the baseball team. I have been waiting years to see it. Just wished that it was dubbed and not just subbed like the first season, which has both from Funimation. I fell in love with this anime because of the dub voices, they make it so fun to watch. Which I do over and over again. Hope this 2nd season comes out dubbed later on with the original dubbed voice cast because that would be awesome! Is 2nd Season worth a pick up? Big Windup! Season Two picks up right where Season One left off and that's basically all I can say about the story without spoiling it as it just gets going immediately. All your favorite characters are back so no need to worry there. The quality on the discs themselves is great. The menus on all three discs are good and easy to navigate. The animation quality is just as good if not a little better than the first season. The lack of a dub is incredibly disappointing as the dub Funimation did on the first season was phenomenal but it can't be helped since this is no longer a Funimation release. The subtitle track is excellent however so there is that at least. Overall it's a great release despite it's shortcomings in certain areas that I would recommend you pick up if you're a fan of the series and enjoyed the first season. Big Windup!/Oofuri is my favorite series, and is very important to me! I've been a fan of the series for 7 years. It was incredibly exciting when I found out that there would be an official english release of the second season since I want to support the series in any way I can. I have not bought the dvds yet, but wanted to give a good review to help show that there is an audience for Oofuri. I will be buying this very soon and look forward to finally having the full anime in my collection! After...well for me I only watched the first series this past April after having it be recommended to me at least a whole year before, so I didn't have to wait as long as everyone else, but man did I fall in love with the first one and hearing about Nozomi picking this up, I was so excited. I was a little disappointed that this wasn't going to be dubbed because the dub for season one was one of the best I had ever heard, but I'll take this any way I can. If you enjoy sports anime, especially baseball, watch the first one. If you have and don't mind there not being any English dub, then I'd recommend this series endlessly. I enjoyed both Big Windup 1st season and Big Windup 2. If the manga even gets printed in English and in omnibus prints i will will buy those as well. I've seen this DVD set twice now, and my verdict is that it's really good, but not quite as good as Season 1. Season 2 addressed the issue of Mihashi's absolute dependence on Abe. I loved pretty much every part of this season involving Mihashi, Abe, and his teammates. I could have done without the stuff involving the menacing coach - he added a weird edge to the show, and I'd gladly have traded him for more scenes with just about anyone else. The developments at the end were great, but the way things wrapped up left me feeling unsatisfied. That said, I'm still glad I watched this. I just wish there were a third season, or more episodes in this season, or that the manga were available in English. Production-wise, I only missed the English dub a little, and I really liked the decision to use yellow for primary subtitling and white for background voices, which was easier to follow than Funimation's choice of white for everything. The anime is great but the subtitles on this disc set are really, really bad, to the point of being worthless. Aside from your garden variety incoherent English sentences and nonsensical conversations, this translation team also apparently didn't understand baseball at all. For example, they translate ストレート (sutoreito aka fastball) as "straight axis." In another instance, instead of talking about a character not giving up a lot of walks, they said the character didn't give up a lot of walk-offs. Both of these errors were in the first episode. In a series as baseball-heavy as this one this is unforgivable. The set is all right if you intend to watch it in Japanese without subtitles, because the subtitles CAN be turned off, but I can't recommend this set otherwise. It really disappointed me because this is one of my favorite series of all time, and I hate to see it get this kind of treatment. I've been waiting for a while for this second season and it's finally here. In case that you were wondering Big Windup! is an unusual sports series. There are no special moves or metaforical beasts in the background. Just teenagers doing their best. Thisond season is not available anywhere else so I would strongly recommend to not only sports anime fans but fans of good written characters and realistic settings.